In large bowl, place potato slices. Generously sprinkle with salt and pepper; toss. In each muffin cup, place 2 potato slices. Sprinkle 1/2 tablespoon cheese into each cup. Add 2 more potato slices to each cup. To each cup, add 2 more potato slices and another 1/2 tablespoon cheese. Top each with a final layer of 2 potato slices. Pour 1 tablespoon cream over each. Bake 30 to 35 minutes or until potatoes are golden brown and tender when pierced with knife. Run knife around each gratin. Place cookie sheet or large plate upside down over pan; turn cookie sheet and pan over to release gratins. Flip gratins right side up. Sprinkle with parsley. 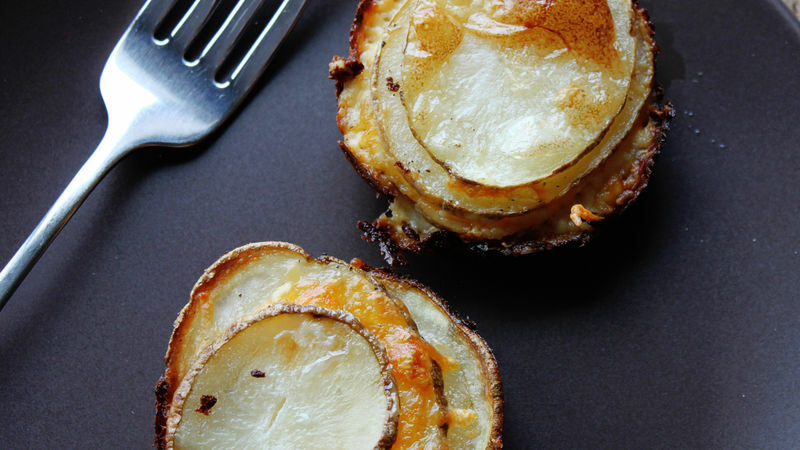 You could substitute any type of cheese in these potatoes. Using a mandolin really helps with the slicing of these potatoes. They all came out even! If you have one, give it a try!